Firstly running keeps me healthy, strong and fit. I do a lot of thinking and planning when I run alone. There is nothing better than going for a run to clear the head. I love it, has become part of my life. I have met so many great people through running they have become my second family. 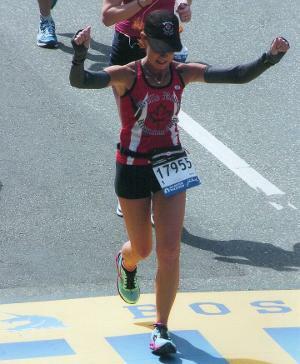 Running Boston was the best experience the whole city lines the streets to cheer us on, I felt like a rock star. When I run marathons I always run with a pace group and appreciate the pacer, it’s something always wanted to do. The experience of getting runners to that finish line at their goals time is the best feeling. . I had the pleasure to pace my 24 year old daughter through her first half and we had a few tag along and it was the best experience for me, really enjoyed helping these runners achieve their goal times. I take my running seriously but at the same time want to make it an enjoyable and rewarding experience. Every runner has a story and I really enjoy meeting new people and talking the miles away. YOU CAN DO THIS!! The work is done so let’s have a blast and enjoy the scenery and company! Training is so important put the miles in and do the work and you will have success!